Use for acute and chronic sinus congestion marked by thick yellow nasal discharge, heat and redness around the sinus cavities, and sinus pain or headache. Use for nasal symptoms such as runny, stuffy nose due to common cold or flu or allergies, also earache or congestion. Pe Min Kan Wan is a popular and well-known herbal supplement that promotes the health and well being of the nasal passage and sinuses. Magnolia and Xanthium bring the formula to the nasal area and open the nasal orifice. 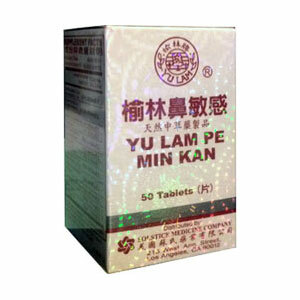 When the predominant symptoms are sneezing or watery eyes, the Bi Yan Pian formula may be more suitable. Expel Wind, eliminate inflammation, stop headache due to Outside Pernicious Influence Wind, reduce asthma due to allergy. Clears heat, resolves toxin, transforms phlegm, dispels turbidity, diffuses the lung, opens the nasal passages, dispels damp. Use for acute and chronic sinus congestion marked by thick yellow nasal discharge, heat and redness around the sinus cavities, and sinus pain or headache. Use for nasal symptoms such as runny, stuffy nose due to common cold or flu or allergies, also earache or congestion. Rhinitis, acute or chronic sinusitis with possible symptoms of headaches and dizziness. Allergic rhinitis, chronic rhinitis, nasal sinusitis with stuffy, runny nose, sneezing, cough or asthma due to allergy. Acute or chronic bronchitis.